How to configure your Cron Job? 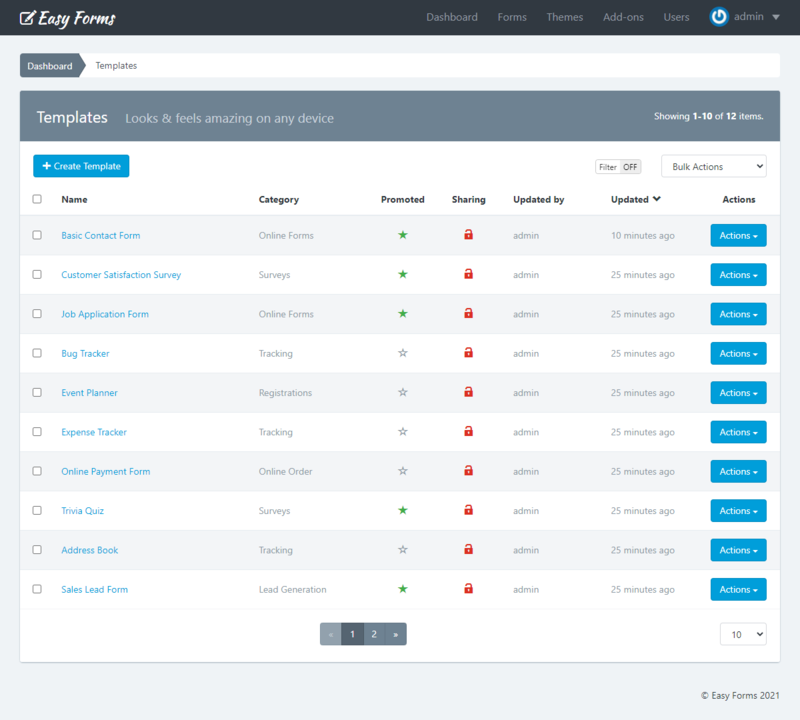 Easy Forms is an application developed in object oriented PHP under the MVC pattern. If you have programming skills, it will be easy to customize Easy Forms according to your requirements. However, this guide is intended for users who don't have programming knowledge. Important! To use reCAPTCHA component in the form builder, you must first add reCAPTCHA keys in the site configuration. Otherwise, reCAPTCHA will not operate. If you created the form before adding the keys, you must update the form. Renaming the application and Logo. Set the default mail application according to your domain. Enable Membership. You can read more here. The first thing to do to customize your application is change the logo. The logo is not an image but a text that you can modify by simply renaming the application. Change the name to 'My Forms' or the name you prefer, better one short. The page will reload and will show a message to let you know that the update has been successful. 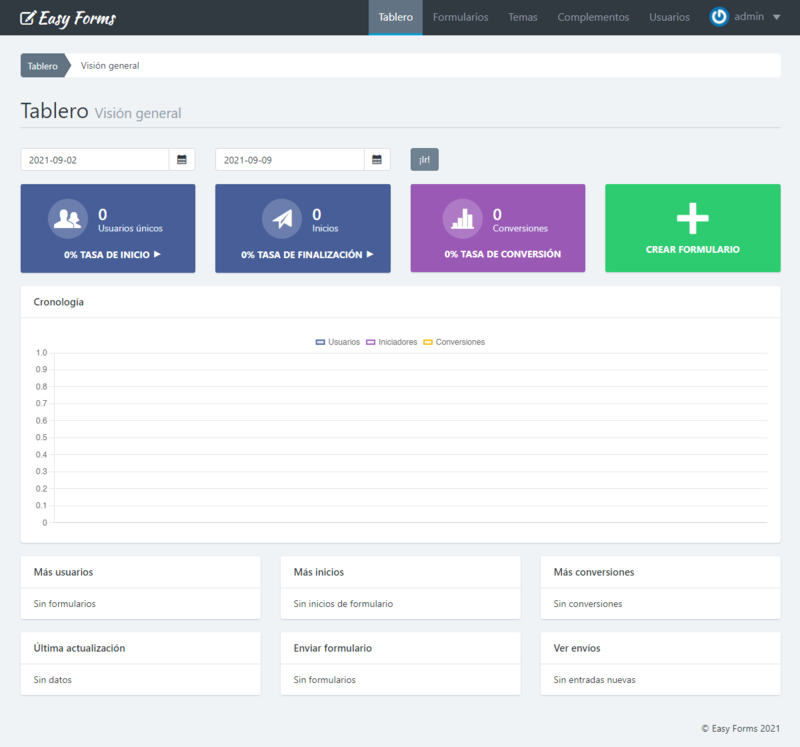 Now 'My Forms' will appear as the application logo. In short, your must upload the GeoLite2 DB to your server and enable Google Maps. Download GeoLite2 City and GeoLite2 Country databases. Unzip the files and place them in the directory @app/components/analytics/enricher/GeoIP. Note: The Google Maps Api Key is required by the Submission Manager to show you the sender information. Send emails by using the PHP native function - mail() - suffer from many drawbacks in terms of Deliverability. Many anti spam filters end up blocking these emails. To avoid this problem, you must configure an SMTP account in the application to send all mail through it. Change the value of 'App.Mailer.transport' to 'smtp'. The SMTP server authentication data can be the one that comes with your hosting plan or by using an external service, such as Hotmail, Yahoo, Gmail or other. As an example, consider how to configure the SMTP server with a Google Apps account or Gmail. Note: You can read more information in our Email Setup documentation. Important! Asynchronous Email Notifications are sent by the Cron Job, so you must enable it first. Change the value of 'App.Mailer.async' to 1. Note: This feature is especially useful if you are sending your emails vis SMTP. 1. Click on your username in the navigation menu. 4. Copy the Cron Job command. 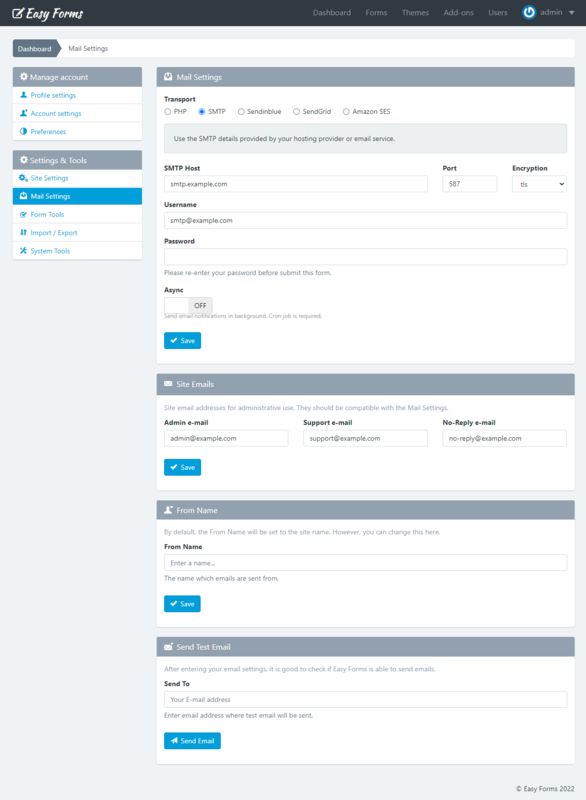 The Form Manager displays 5 rows by default, Submission Manager, User Manager and others. You can change this very easily. Change the value of 'GridView.pagination.pageSize' to `10 or the number of rows you want. When you return to the app it will display the number of rows you have defined. Securing your site is important. After all, it means you are protecting not only your personal information and data, but also any information your users collect on your site. That's it! When an unauthorized visitor tries to access that page, he’ll see an 404 error - Page Not Found. Note: If you're not sure which is your IP address, just ask Google. Just enter “What is my IP” and Google will tell you. Change the value of 'Form.Uploads.imageCompression' to 70 or the compression number you want (between 0 and 99). Note: This feature is especially useful if your forms allow users to upload pictures from their mobile devices and you need to save hosting space. Easy Forms comes with the English language by default. However, it let each user change the whole application language very easily, allowing them to see it in their own language. From now on, if your user accesses the application, he will see the interface in Spanish. Note: Keep in mind that at any moment your user can change the application language. For this, he will only need to update the field Language on his User Profile. Open the configuration file @app/config/web.php. Find the line: 'language' => 'en-US’, and replace 'en-US' for another language you have translated, to Spanish for example: ‘es-ES’. When you reload the application you will see that the application default language is Spanish. Translate English strings to the new language. Add the new language to the list of languages supported by the application. Locate the @app/messages folder and create a new folder which name include the ISO language code (in lowercase) and the ISO country code (in uppercase), separated by a hyphen. For example, Brazilian Portuguese, 'pt-BR'. Then copy the file app.php from the 'es-ES' folder and paste it into your new folder. Let's say in 'pt-BR'. Then translate strings from English to the new language (To continue our example, replace strings in Spanish to Portuguese). Save the file and the application will be translated to the new language. Add the line "pt-BR" => Yii :: t ('app', 'Portuguese'), to suportedLanguage() method. 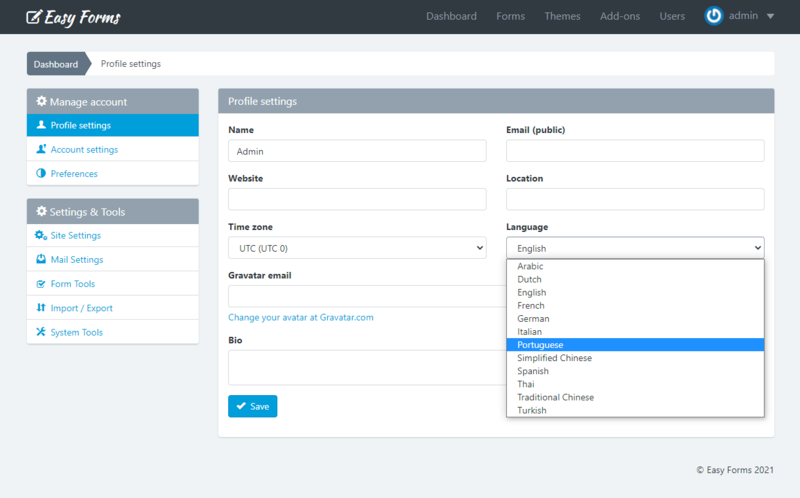 From now on, when you enter the application, you can change the language to portuguese from your User Profile. Note: Keep in mind that the text you type in the source code must be in English. Open the file @app/messages/es-ES/app.php and add ‘Portuguese’ => ‘Portugués’,. Open the file @app/messages/pt-BR/app.php and add ‘Portuguese’ => ‘Português’,. To enable DEBUG mode you must remove the // characters (lines 3 and 4) in the @app/index.php file. Then, you will be able to see the error message and stack trace. Important! After fix any issue or make any customization but before deployed to production, you must comment out the same two lines. 6. Repeat the same steps with the 'assets' and 'static_files' directories. Note: If you have trouble setting permissions, get in touch with our support team and we will be more than happy to help you.